Our Sweet Deal Raffle Just Got Sweeter!! Stephen Holt of 29 Again Custom Fitness [our next door neighbor!] has generously donated 5 ~ $100 gift cards. Now you can enter for both the Hershey Park tickets & candy basket AND the 29AgainCustomFitness raffles. Winners will be picked on Saturday, May 7th at 4:30pm. You do not need to be present to win. We’re looking forward to seeing you! Customer Appreciation Days!! Thursday, Friday and Saturday!! While we value and appreciate our customers every day, once a year, we like to celebrate their patronage with a special Customer Appreciation Event! So this Thursday, Friday and Saturday, I would like to invite all of our customers, Old and New, to visit our Timonium Store and take advantage of Special Savings and Events planned just for you! Thursday, May 5th- Free Delivery and Cinco de Mayo Happy Hour! All purchases made on May 5th will include Free Local Delivery- a $75 value! All purchases outside of our delivery area will receive $75 off the delivery fee! Cinco De Mayo Happy Hour from 4pm to 7pm! Join us for Free Mexican Food, Non-alcoholic Beverages, and Music! Friday, May 6th- Store-Wide Sofa Sale and Ask the Designer Seminar! $50 Off Every Sofa in the Store- New and Consigned! Rita Alexander, CEO and Creative Principal at Chrysalis Interiors, will be here from 2 pm to 4 pm to answer any design and decorating questions. From creating a color scheme for your home, to furniture layout, and more, she will show you the most effective way to bring it all together to create your own personal style! Saturday, May 7th- Warehouse Sale and Furniture Care Demonstrations! 20% Off All the Unprepped Furniture in our Warehouse! Furniture Care Demonstration- 10am to 2pm! Our own Lillie Taormino will Demonstate how we make every piece of furniture ready to put in your home! She’ll also be answer questions and giving suggestions on how to keep your furniture looking great for years and years! Sweet Deal Raffle Every Day! Whether you come in once, or all three days, enter our Free Raffle Each Time You Visit! Four Free Hershey Park Tickets! A $220 Value! The Drawing will be Saturday, May 7th, at 4:30 pm. You do not have to be present to win! Cornerstone owner Ted Drabik and his wife Mary enjoyed an evening out. 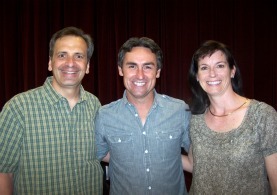 Call it a “busman’s holiday”, but when Mary heard that Mike Wolfe (Host of History Channels “American Pickers”) would be speaking at the Penn State York campus, she couldn’t resist getting tickets for the fun-filled event. Mike was just as charming as he seems on tv, and told stories of the almost five year struggle to get his show on the air, as well as many behind the camera stories from the series. Ted was able to share some of his own “getting started” stories with Mike at a meet-and-greet after the show. But as far as an interest in hitting the road to look for treasures? Ted prefers the ongoing relationships he’s able to enjoy year after year by having a retail store. Besides, he’d miss his wife and four girls too much! If you prefer lighter wood furniture, but still want high quality, Cornerstone can help! We’ve added some beautiful pre-owned pieces this week from Lexington, EJ Victor, Ethan Allen and More- all in lighter woods and finishes that are sure to brighten up a room. You’ll find a gorgeous pair of twin beds with hand-painted details, a cherry slate-top coffee table, maple and light cherry queen beds, casual upholstered chairs and much, much, more. Love the “Only Cornerstone” Shopping Experience? Become a facebook fan and we’ll keep up to date as we replenish our inventory, as well as informed on all specials and store events. Just click on our facebook link on the top left of this page. 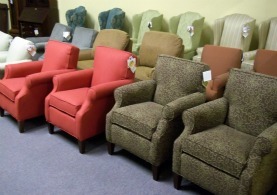 Here’s a picture of just several of the pairs of chairs we just received from Sam Moore and Craftmaster. You’ll find styles from Traditional Wing Chairs to Transitional Club Chairs, all in a great variety of fabrics. The “Only Cornerstone” twist?…..We’ve ordered these high quality chairs in Discontinued Fabrics to make the price almost to good to be true! Better still, the fabrics are as varied as they are beautiful, so everyone is sure to find something that works with their decor. Come in soon to get the very best selection. 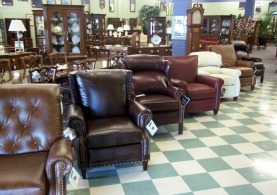 Shown here are just a few of the Bradington Young Leather Recliners we recently received. This group is part of a special package deal we made to bring you these High Quality American Made all leather recliners at prices almost to good to be true! The group includes our first ever Power Recliners on the popular Chippendale Model- this great looking recliner opens and closes at the touch of a button! The last deal we made with Bradington Young Sold Out very quickly and didn’t have this great variety of colors and styles. So check out the recliners by clicking Bradington Young under manufacturers- then hurry in to do the “seat test” to see which one you want to take home. Who brings you high quality New and Pre-owned furniture at unbelievable prices? Only Cornerstone! Whether your kids are finding their way into your room at night, or you just need a little more room to spread out, a King Size Bed may be the solution you need. 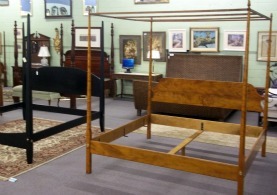 While pre-owned king size beds are usually hard to come by, there are currently several in the store. We also have a brand new Wicker Sleigh Bed from Universal Furniture. This Factory Close-out is also available in a Queen size. So stop in today to see just how far your furniture dollar can go when you shop at Cornerstone. 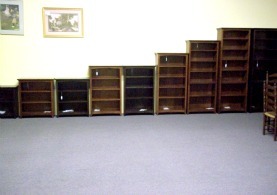 We’ve just received our first shipment of bookcases from Whittier Furniture. These “Made in America” bookcases will give our customers a wide range of sizes to choose from. 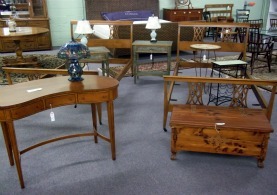 And with prices from $240 to $595, these pieces are another great Cornerstone value.So come in and take one home today. And remember, if you need a special size for that hard to fit spot, we also have a our “custom made” area. Here you’ll be able to pick your size, color and trim details to build a piece just the way you envisioned it. It’s a great way to create a “built in” look at an “Only Cornerstone” price. Click our “custom made pieces” on the manufacturers dropdown to see all we can do for you. Inlaid Banded Tables in Stock!! 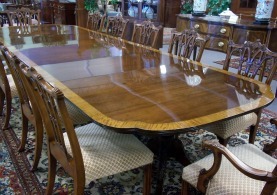 This beautiful mahogany three part inlaid table measures over 13 feet long! When you think of high quality banquet size tables, this is the table of your dreams. Even more versatile, you can set it up in a variety of sizes. Stop by the store, and you’ll be able to take a close look at the intricately carved pedestals. In addition to this fabulous table, we have several other high quality inlaid dining room tables in stock. (search “Dining Room Tables”) So don’t wait until Fall to update and furnish your formal dining room. Shop now while the selection is great and get exactly what you want- The Right Piece, The Right Price, Right Now! Only Cornerstone. Join us this Wednesday, March 16th, from 10am to 4pm for a Free Appraisal Day. 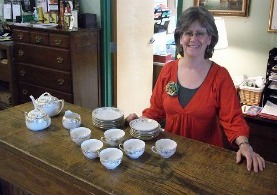 Our own highly knowledgeable Beth Plein (shown in the picture) will give a free market-value appraisal for your antique or pre-owned porcelain, sterling, paintings, furniture and more. Beth, a second-generation antiques dealer, has years of experience appraising objects of value in many catagories. Cornerstone offers this valuable service at no charge on these special appraisal days throughout the year! Join our Email Club to stay informed on all special events here at the store. Call the store with any questions. See you there!